The faculty and staff of the school consider each moment in class imperative for success. When the student is not in the classroom, the information missed cannot be recaptured. Students who are excessively absent (30% or more of classroom hours) will be placed on probation without notice.If the student’s attendance does not improve, the student will be dropped from the program. Students will not be readmitted without approval of the primary instructor and Director. If a student is absent for a test he/she will be given an opportunity to retest at the earliest convenience of the instructor. Makeup classes may be required at the discretion of the instructor and with approval of the Director. A student is considered tardy when arriving 10 minutes or more after the start of class, or leaving 10 minutes or more before the end of class. Tardiness and early departures are included in the student’s attendance record of absences. The school has an open enrollment period and start dates are assigned upon the number of students enrolled. Students wishing to be absent on other nationally recognized holidays must request so in writing to the Program Director at least three school days prior to the holiday. At least once a week, the Director monitors the student attendance cards of all active students and calls those students that have missed one or two days during that week. Students are required to have an overall attendance rate of 70% or more to meet the minimum attendance requirement of the program. A student who has consecutively missed more than one-third of the scheduled class hours in any given level or module will be put on probation until the end of the next scheduled level or module. A probation letter will be sent to that student. Grade point average required for certifying completion of each course is a minimum cumulative passing grade of 70%. The course retake policy is offered to students who have unsuccessfully completed a course and received less than 70%. The student will be charged tuition at the appropriate rate. Students are not allowed to attempt more than 1.5 times, or 150%, of the number of credits in their program of study. The requirements for rate of progress are to assure that students are progressing at a rate at which they will complete their programs within the maximum time frame. Satisfactory progression in registered courses maintaining a cumulative grade point average (GPA) of 2.0 at midpoint of program. To avoid academic probation, students must maintain a minimum GPA of 70% or C. Students maintaining a 70% GPA must be counseled by the instructor, which will be noted on progress report. Students not meeting said conditions will be scheduled for conference with the school’s director, and may result in probation for the student.Students are expected to be prepared and meet the demands of the coursework they have chosen. Students should review the curriculum schedule for each course and ask any questions regarding the curriculum before starting the program. Students will be notified and given an exact time schedule for courses. Students must immediately notify the school if they are unable to meet at the scheduled time. Tardiness within any consecutive two-week period can result in the disciplinary action of probation. Chronic tardiness can lead to dismissal. Two tardies are counted as one absence. Students under such restriction will be counseled and monitored to see if their situation improves. Students not responding to probation, counseling or suspension can be dismissed at the discretion of the school’s administrator. Leave of Absence, including military leave, National Guard, The Reserves’ annual two-week training, or call for temporary active duty shall be reasonable in duration and shall not exceed 30 school days or 60 calendar days in any 12-month period. Leave shall be for specific and acceptable purposes. A written request for leave must be properly signed and dated by both the student and authorized school administrator, and be placed in the student’s individual file within one week of the beginning of the leave. If a student fails to return from leave, he or she is automatically terminated with a refund consummated within 30 days. Make-up work may be required for any absence. It is the responsibility of the student and must be completed after each absence. Students must make personal arrangements with individual instructors to make-up missed work. Hours of make-up work may be substituted as hours of class attendance. If the student fails to attend school for more than 10 consecutive days, the school will consider the student a drop and automatically withdraw him/her from the program. Failure to attend school for 10 consecutive class days. Failure to return from an approved leave of absence on the scheduled return date. Failure to maintain satisfactory progress for two consecutive modules. Failure to fulfill financial agreements. Failing any course in the program twice during the one enrollment period. If the student has failed to maintain satisfactory progress after the midpoint, the student will be placed on probation for 30 days. At the end of the period the student will be re-evaluated. Have a satisfactory progress report from the instructor. If the conditions are met, the probationary status will be lifted. Failure to achieve satisfactory progress after the probationary period will result in dismissal from the school unless a special condition is made and documented by the director. Students may appeal their probationary status by submitting an appeals letter to the school’s director. All such requests will be evaluated and acted upon promptly. Students are expected to dress and act properly while attending classes. At the discretion of the school administration, a student may be dismissed from school for a serious incident or repeated incidents of an intoxicated or drugged state of behavior, possession of drugs or alcohol upon school premises, possession of weapons upon school premises, behavior creating a safety hazard to other persons at school, disobedient or disrespectful behavior to other students, an administrator, or faculty member, or any other stated or determined infractions of conduct. The student must attend classes continuously and complete the required training, unless placed on a job prior to class end. The student must call the Micro Easy office prior to missing a class. If the student cannot attend a class, he/she is responsible for making up missed assignments. Students are required to be courteous and professional to staff and fellow students. Beverages and food are not allowed in the training areas. Students must pick up and clean after themselves. Students should be considerate of others and the facility. Students must make personal calls on their cell phones or public pay phone. In the case of emergency or employment-related calls, student must get permission from staff. Students are not permitted to smoke on school premises. If a student needs to smoke, he/she must do so outside the school’s premises. Students are expected to dress in a clean and tidy manner. When warranted, students will be asked on occasion to dress in more traditional business attire. Students are expected to comply with school policy regarding curriculum, testing, absences, tardiness and makeup work while displaying courtesy and consideration towards instructors, staff and other students. Micro-Easy Vocational Institute defines improper conduct as the following: fighting on campus; destruction, abuse or theft of property; the use or sale of alcohol or illegal drugs on campus; sexual misconduct; and disregard for school policy. Improper conduct is cause for suspension or expulsion. The school reserves the right to postpone training in the event of Acts of God, labor disputes, equipment failure, etc. Students will be duly notified and compensated, if applicable. 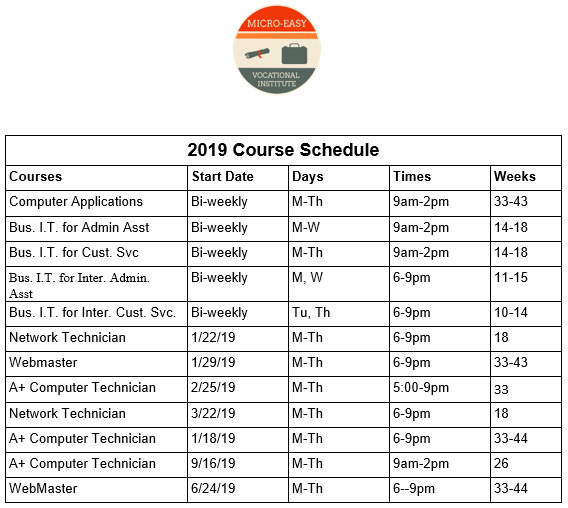 All course schedules are subject to change in terms of start and completion date. Students will be notified and offered the opportunity to consent as provided by law. In cases where such change would cause undue hardship, a refund will be offered. The maximum postponement of a class start date is 90 days.The school reserves the right to withdraw a scheduled course if the registration is insufficient to warrant holding the class. All monies paid will be refunded. Micro-Easy Vocational Institute assumes no responsibility for loss or damage to personal property, or for personal injury, which may occur while on the campus grounds or on a field trip. Micro-Easy Vocational Institute will maintain student records for five years, as required by state law. Student transcripts will be maintained for permanently. Students have a right to access their records anytime that the institution is open and during normal business hours. Students desiring to view their records may request to see their records in the school office during normal business hours or may schedule a time to review records that is convenient to both the student and the school administration. If an appointment is made, the appointment shall be made no later than 48 hours after the student has requested to view their records. Extensions of this time shall be granted only upon decision of the student. Only the student and the school administration have a right to review student records. No outside personnel will be allowed to view records except for appropriate state regulatory, federal regulatory or accrediting agency officials or upon proper subpoena. A transcript for course work will be issued upon request by the student. All transcripts of training will be kept for a period of at least 5 years upon completion or withdrawal of the student. Financial payment documents will be kept for a period of at least 5 years after completion or withdrawal of the student. The institution reserves the right to issue transcripts for training for which the student has paid tuition. The institution reserves the right to refuse to issue transcripts for training for which the student has not paid.